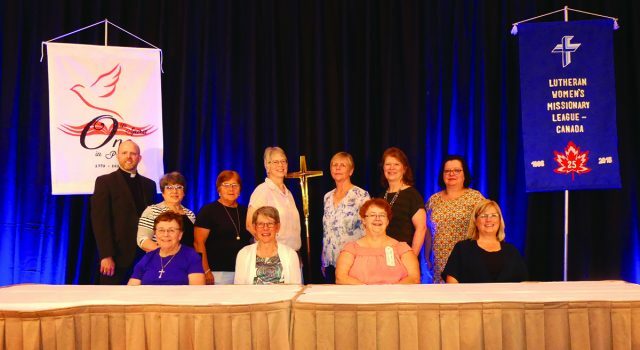 Twenty-five years after becoming an autonomous Canadian organization, Lutheran Women’s Missionary League-Canada celebrated the occasion July 5-8, 2018 in Winnipeg under the same theme from 1993 – “One in Spirit, One in Purpose.” There was an anniversary cake, photos from the founding convention and other conventions and events, and many memories shared. One of the moments of excitement came with the unveiling of a new logo. Intertwined hearts illustrate Christ’s heart interwoven with our hearts, the diversity of the women of Lutheran Church-Canada and the love we have for Jesus, each other and those we serve. Tara Lyn Hart served as keynote speaker, as speaker at an afternoon interest session and as entertainer through song at the banquet. 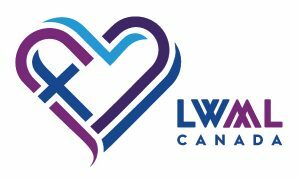 Greetings were brought from several organizations including Ida Mall of Lutheran Women’s Missionary League in the U.S. Ida was president when the women of Lutheran Church-Canada were full participants of the last convention of International LWML in Edmonton, Alberta in 1993. Dr. Leah Block helped unpack “medical assistance in dying” in a Christian context. Rev. Assefa Aredo, first graduate of the Pastors with Alternate Training (PAT) program and Yeshi Olkeba, both from the Oromo community, described their experiences as refugees and integration into the Winnipeg and Lutheran communities. Seven women from LWML-Canada shared experiences from their Sister to Sister mission trip to Nicaragua and Costa Rica and the needs of the women there. First item of business at the convention was consideration of a new set of bylaws that would make major changes in how the organization is structured. A 2/3 majority was required for adoption. The vote was two votes short of that majority. Following considerable discussion and following procedure outlined by the league’s lawyer the voting body approved reconsideration of the decision and a second vote was taken. The result was identical to the first and the restructuring was defeated. Each triennium a goal is set, and projects are selected to receive mission grants. For 2018-2021 the goal is $130,000. This is in addition to the goals set by the four districts of LWML-Canada. Delegates chose 20%, or $26,000, as the amount set aside for a Mission Opportunity Fund whereby projects arising during the triennium may receive funding. The balance of the funds will go to the following: Circuit rider transportation, Atlantic Canada; mission and ministry projects by Good Shepherd Lutheran Church, Moncton, N.B. ; regional VBS teams for remote congregations; LCC national youth gathering; Rancheria feeding and education program, Nicaragua; evangelism course outreach, CLTS, St. Catharines; technology upgrade, Zion Lutheran Christian School, Prince George, B.C. ; youth ministry, Central America; and evangelists/deaconesses, Nicaragua. Grants will be paid as requested and as mite monies are received. During the convention offerings and donations to a walk for missions were received to assist the PAT program, to fund a retreat for women in Costa Rica, to jump-start the mission grant goal and for education for deaconesses in Central America. The total exceeded $24,000. An anniversary offering is also being taken by local societies throughout 2018 to support the diaconate program being re-established at Concordia Lutheran Seminary, Edmonton. A special note of thanks goes to LCC Central District for covering the cost of interpreters for the Deaf allowing two women from B.C. to participate in the entire convention and two from Winnipeg to attend for part of the convention. General Council 2018-2021: (l-r back) Rev. Jef Dul, Pastoral Counsellor; Linda Horton, ABC LWMLC District President; Janice Buchner, Ontario LWMLC District President; Pat Geick, Laurentian LWMLC District President; Jamie Fulton, Recording Secretary; Patricia Kreutzwieser, Vice-President, Christian Growth; Annette Borchardt, Vice-President, Member Development. (front) Fay Schatschneider, Financial Secretary; Linda Long, President; Beverly McKean, Vice-President, Christian Mission; Becky Wandio, Vice-President, Communication. Unable to attend: Arlene Kish, Central LWMLC District, President. The positions of treasurer and second pastoral counsellor are yet to be filled. Delegates set the mission grant goal for 2018-2021 at $130,000. The Mission Opportunity Fund is a permanent feature and delegates chose to fund it with 20% of the total goal ($26,000). The following list is ordered by the number of votes received. As usual, since that may not be the order in which the recipients are ready to use the funds, the grants will be paid in the order of requests received from those to be funded. These totals will continue to grow as money continued to be received during the convention and hadn’t yet been counted. Note: Anniversary celebrations by local societies and zones will continue throughout 2018. Anniversary offerings may be sent to Financial Secretary Rachel Kuhl (2 Tiffany Cres., Kanata, ON K2K 1W2) any time during the year. The offering will support the deaconess program (including Director of Parish Services) now being run by Concordia Lutheran Seminary, Edmonton. Bylaw amendments to current structure were approved. Registration totalled 167 including about 20 one-day registrants. Additional convention information we shared via zone delegates, Tapestry, The Canadian Lutheran and the lutheranwomen.ca website.